Phase I was completed in 2005. Another grant from CFI and from Research, Science and Technology provincial department allowed for the purchase of scientific equipment (for field and laboratory) and station’s furniture. Tembec, Norbord, Domtar, Matériaux Blanchet, Landrienne Sawmill, Honeywell, Abitibi-Consolidated, Trame and Selbaie Mines gave the bulk of construction material and research station equipment. The first director of the laboratory was Bernhard Denneler (1963 - 2007). This obituary was originally published in Dendrochronologia, Volume 25, Issue 1, 16 May 2007, Page 71. Also, an air-conditioned storehouse allows for long term conservation of samples. Samples of most of the dendroecology studies conducted in the region since de 1980s are stored in that room. Finally, this pavilion incorporates work stations for students and trainees. For more information, please contact Igor Drobyshev (igor.drobyshev@uqat.ca) or visit the laboratory website at http://ekskog.org/dendro/. 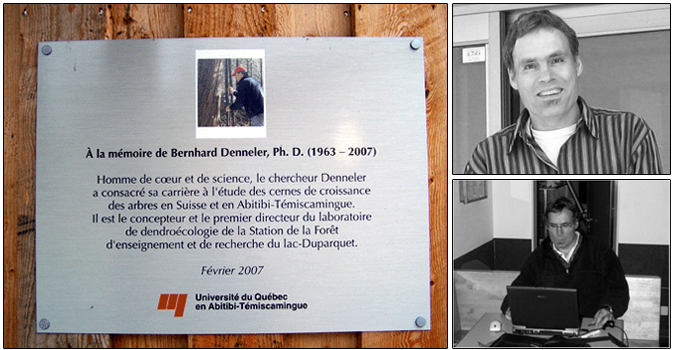 In 2010, an extension of the laboratory of dendroecology allowed the addition of two rooms dedicated to paleoecology. Microscope, binocular loupes, sieve, refrigerator and freezer find their place. Many sediment collection probes are also available (kajak, Russian, Livingstone).